It's back! Disneyland's iconic Main Street Electrical Parade returns home January 20th, dazzling a new generation of resort guests. The colorful after-dark parade features the beloved ‘Baroque Hoedown' synthesizer soundtrack as Mickey Mouse, Minnie Mouse, and Goofy lead the way while the memorable stories from Peter Pan, Snow White, Pinocchio, Alice in Wonderland, and Pete's Dragon come to life in parade floats covered in approximately half a million twinkling lights. Don't miss the sights, sounds, music, and fun from one of the most popular Disney parades, the Main Street Electrical Parade, with nightly performances scheduled now through June 18th, 2017. To say I'm excited for the return of the Main Street Electrical Parade is an understatement. I fondly remember as a child when our school band was invited to march down Main Street U.S.A., watching the Main Street Electrical Parade after our performance. Sitting on the curb along Main Street U.S.A. with a lollipop in hand, watching the larger than life floats roll by was AMAZING! Now, our children have the opportunity to make the same unforgettable memories I have, and I couldn't be more excited for them! Some of the parade's most impressive scenes are the 18 1/2 foot tall Clock Tower looming over Cinderella's Ball, Elliot, the smoke-breathing dragon from ‘Pete's Dragon,' and the 118-foot long finale unit, a red-white-and-blue tribute to America. Main Street Electrical Parade Dining Packages, including reserved viewing of the parade, are available at www.disneyland.com. The spectacular pageant of nighttime magic has some fascinating numbers. Here's a closer look at the legacy of the Main Street Electrical Parade. Approximately 600,000 lights sparkle in the parade's journey from Small World Mall in Fantasy Land to Town Square on Main Street, U.S.A.
22 floats illuminate the parade route at Disneyland, nearly doubling the number from the parade's debut (12) in 1972. 7 films are represented in the parade. Alice in Wonderland, Cinderella, Peter Pan, Snow White and the Seven Dwarfs, Pinocchio, Dumbo, and Pete's Dragon. 27 beloved Disney characters perform throughout the show including Goofy, Mickey Mouse, Cinderella, Captain Hook, and Tiner Bell. 80 parade performers (estimated number per night) bring the magic to light. 8 jittering insect floats spin and dance for guests during the Alice in Wonderland sequence. At 18 1/2 feet high, the Clock Tower in the Cinderella sequence is the tallest float. At 118 feet long, the To Honor America float is the longest float in the parade. At 5,600 pounds, the massive Elliot float, measures 16 feet tall, 10 feet wide, and 38 feet long. 2 composers, Jean-Jacques Perrey and Gershon Kingsley, wrote the iconic synthesizer piece known as Baroque Hoedown. 6 different colors of light bulbs flash throughout the parade, in amber, blue, green, chartreuse, red, and pink. 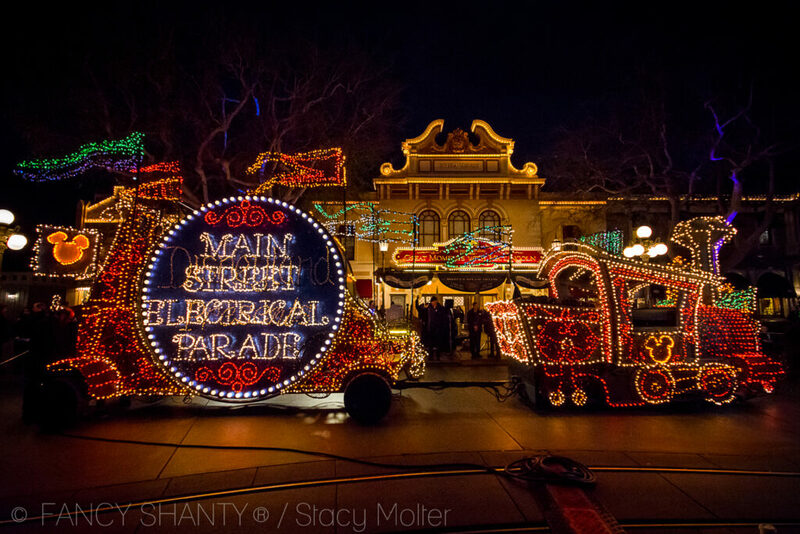 5 Disney Parks have presented versions of the Main Street Electrical Parade including Disneyland, Walt Disney World Magic Kingdom Park, Disney California Adventure Park, Tokyo Disneyland, and Disneyland Paris. In addition to the return of the Main Street Electrical Parade, don't miss your chance to check out the limited-time Lunar New Year Celebration going on now through February 5th at Disney California Adventure Park. The Lunar New Year Celebration invites guests to experience Chineses and Vietnamese cultures through a variety of live performances, fun-filled activities, beautiful decor, and all-new menus inspired by the cultures of China, Korea, and Vietnam. We were invited by Disneyland Resorts to the premiere of the return of the Main Street Electrical Parade. Portions of this material have been provided courtesy of Disneyland Resorts.